December 2015 – "A ship defines the ocean"
Here I reproduce information from the Norfolk Southern and CSX timetables. I have many times wished I had this to pull up on my iphone in a form other than the bulky PDFs this data is from. Stations marked “not in timetable” represent signals that trains have been observed to call out (“Clear Doraville, NS 203 southbound”) over the scanner. NS generally does not list intermediate signals (between control points) in their timetables, but they may be shown on their track diagrams. Not sure about CSX. Text in italics is additional commentary, not from timetable. First, a “British subway map” of these lines. Obviously not to scale. East End district connects here. Can be seen from Marietta Blvd overpass. Behind Bim’s Liquor store/King Plow parking lot. See blog entry. Visible from Marietta Street overpass / parking lot at end of 10th street. Street dead-ends at tracks. Frequent crew-change point. Stopped trains visible from Marietta St bridge. Between Northside Drive bridge and North Avenue tunnel. Visible from Mitchell, Nelson, Peters Streets. See blog entry. Very new signal sign just south of Peters St.
Nearly-abandoned yard on McDaniel St, home to Pegram Shops and the Walking Dead’s “Terminus”. Fayetteville Rd. and Old Constitution Rd. Moreland Ave (US 23) and E. Conley Rd. Ex-Central of Georgia. Shared with CSX to East Point. Murphy Ave, near the Cut Rate Box Company building. Old A&WP belt line connects here. Most of yard can be seen from Harold Sheets Pkwy. Near pedestrian bridge and MARTA. CSX leaves onto its own tracks. Along Old Dixie Hwy. between I-75 and I-285. Main St. and Hale Rd, at south end of yard. Along Metcalf Rd. in Lake City. 572.5? Downtown Lula. Branch line to Athens connects to main line. North of White Sulpur Rd. crossing. Near HF Reed Industrial Park Conn. bridge. Between North and South Berkley Lake Roads. North-facing visible from Rowan Street / Stephens Rd crossing (near RockTenn). Visible from Oakcliff Rd. bridge and from Bankers Industrial Dr.
Next to gravel truck parking lot on New Peachtree Rd, across from Marathon fuel terminal. Grade crossing behind Atlantic Station Target, road is only access to Narjoe Lumber Co. Visible from Westside Provisions District, and from end of Foster Street by Goat Farm arts center. Work in progress… CSX timetable not as easy to cut and paste from as NS! Visible from Marietta Blvd bridge. Behind Bim’s Liquor store/King Plow parking lot. Street ends in parking lot at the tracks. The original name of Ivan Allen Jr Blvd. Where Fairlie Street dead-ends into a pay parking lot. This is the “zero milepost”, although the actual historic milepost marker is slightly to the east, in an underground building. 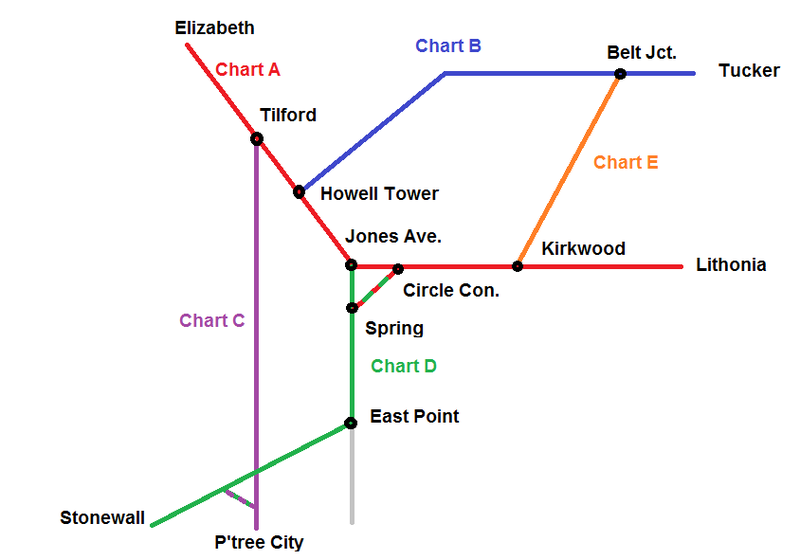 This is where Inman Park Belt (chart D) branches off. Where the Inman Park belt joins (chart E). Old SAL to Birmingham begins here. Near intersection of Jefferson St. and Marietta Blvd. Goes to Bellwood yard. South of Joseph E. Boone, towards Andrews St.
Where the tracks are running alongside I-20. Between Melvin Dr. and Campbelton Rd. MP 844 is next to the park in downtown Union City. Shared with NS from Spring to East Point.